The basic premise is a view of Twitter as a conversation and interaction platform that enables direct and immediate contact with more people than has ever before been possible, and what setup best utilizes this characteristic of Twitter. I should point out that I recently read Shel Israel’s Twitterville, which promotes a similar view of Twitter and includes a large number of case studies from which many of the account types are derived. Most companies appear under the company name at the very least. This is always recommended as well, because unless you grab this piece of digital land, someone else can grab it before you and use it against your company. No person is identified, company logo (or similar) is used as the avatar. One person uses the account and is identified, company logo (or similar) is used as the avatar. One person uses the account and is identified, picture of the person is used as the avatar. Multiple people use the account and they are identified, usually by signing the tweets with their initials, company logo (or similar) is used as the avatar. This can also be further clarified by showing the people who use the account in the background image or describing them in the profile section. While there are successful companies that use the brand logo approach, it will always hurt the most important thing about Twitter – conversation and direct interaction. Twitter is one of the most direct links to customers you can have, and encouraging your customers to really talk with you and give you feedback is the main strength it has. Using only an account with a company logo is for broadcasting, but not much else. One might think that using a team of tweeters and identifying the individual tweeter of each tweet might solve this, but that is trying to have your cake and eat it: you sort of provide the option to interact with a real person, except that the other party never knows which personality will reply. Furthermore, identifying the tweeter eats up valuable characters from the tweet. If you give the keys to a single person and identify him in the profile, what is the purpose of the logo? Some followers will never notice there is just one person behind the logo and will treat it as a corporate entity anyway, and many will not easily notice if the person changes. This approach is hindering your conversations as well. On the other hand, if you use an avatar of a person, the person and brand become one – not necessarily a good thing for a major company, but possibly ideal for a solo entrepreneur or a company that relies heavily on the brand of a single person. Basically, all the same criticism apply to sub-accounts based on the company name. These may nevertheless serve a purpose, but that is usually a broadcasting purpose (such as @DellOutlet that is used to sell refurbished Dell computers). Some alternatives that include actual interaction are to make accounts for specific functions the customers need to reach (such as service) or to make account for real people based on their roles (such as @BestBuyCMO). Accounts for specific functions have their place, depending on the size of the company. Accounts made for real people based on their roles send the wrong first signal, because they still hide the person behind the role. Likewise, it is difficult to identify when the user of such account changes: while the avatar naturally changes (if it is not a logo in the first place), there is no history data when the change took place. Using the employees’ personal accounts for business is a debated issue (for example, see the discussion at Twitip). Leverage the existing followers of active tweeters. Include a good amount of personal touch, thus humanizing the company. Existing followers may not be interested in the company’s offering. Some followers are looking for mostly business-related material, active tweeters may tweet too much personal stuff. The account cannot effectively be made to carry the company’s brand. Employees may not be willing to use their personal account for business. When the person leaves the company, the account goes with him (unless otherwise agreed, and to be honest I have a hard time seeing that happen). I do not recommend using personal accounts for business, except perhaps for solo entrepreneurs. The privacy issues, lack of branding, and significant personal use muddle the business message. Company-branded accounts usually feature the name of the person and the name of the company, in the style of @DudeatCompany, @DudeCompany, or @CompanyDude. These accounts overcome all of the cons of using people’s personal accounts, while retaining some of the benefits. Include a good amount of personal touch, thus humanizing the company. Less than a personal account, but still a good amount. Are the property of the company, reused or used to redirect people to another account should the original owner leave the company. As a second account for active tweeters, may receive less attention than the personal account. On the other hand, followers receive business-related tweets that they are after. Many of the above-mentioned account types can be used by a solo entrepreneur. I am more interested in how a medium-sized or large business should set up its Twitter accounts for maximum benefit. Create an account with your company name. This prevents others from taking your name in Twitter. You may also create account for any prominent brands you have. These accounts are used to broadcast what is going on at your company, retweet interesting material (from both external sources and from other company-branded accounts), and point out when specific people are at particularly interesting events. Create accounts for any functions inside your company that need shared accounts (perhaps outlet or service – perhaps none). You can always create new ones later as need arises. 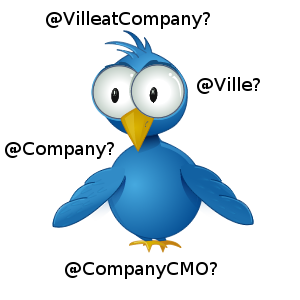 Create company-branded accounts for any tweeting employees, or have the employees create them themselves. You can always create new ones later as need arises. Customize and brand all the accounts: Logo avatars for non-personal accounts, branded avatars (include company name or logo in addition to the picture, or have each employee wear a company shirt and take their picture – perhaps while they are doing their favorite thing wearing the company shirt), similar background graphics, similar profiles (for example, state what each tweeter is working on or their title). Use the company name account to create a list of all company-branded accounts. Keep this list up to date! It provides an easy way for anyone to follow all official tweets from your company. Create a Twitter landing page on your website. On this page, explain what your company is doing in Twitter, who are the people there and what sorts of things they discuss. This gives an interested follower a good idea on who to follow. Keep this page up to date and link to it from all Twitter profiles! This infrastructure will allow you to easily scale your Twitter activities based on employee interest. The main company name account can broadcast important information and also direct attention to the branded employee accounts through retweets and announcements. @Fastems: Fastems is attending #EMO_Hannover! Follow @JyrkiatFastems and @AnskuatFastems for our live tweets from this major event! This infrastructure also handles leaving employees in a smart way: the company retains the business account and can reuse the account or use it to redirect people to another account. The number of accounts depends on your business and the interest from your employees, but I think this is a guideline that can work for most medium-sized or large companies. What do you think works for yours?